The end of World War II set in motion a whirlwind of construction in the United States. In response, toy companies developed metal toy construction vehicles. Toy trucks like the Buddy "L," the Lumar contractor's truck and Tonka became household names. 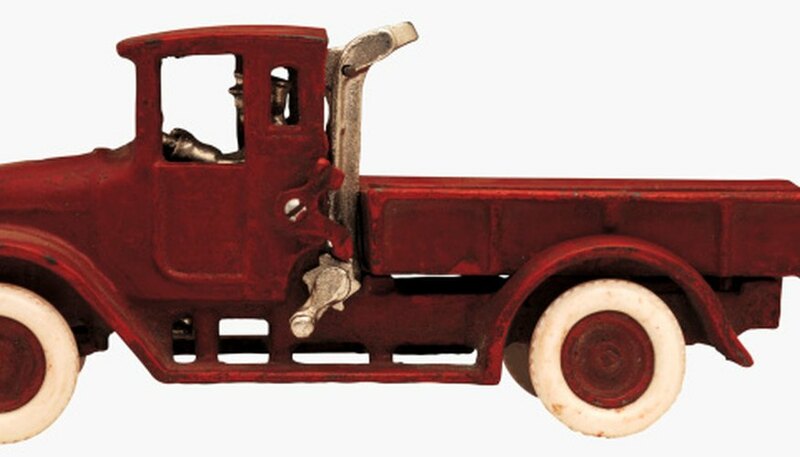 These toy trucks were created to withstand plenty of abuse and look like the real vehicles on the road. While many current collectors of these trucks prefer to leave the vehicles untouched, others enjoy restoring the toys to a former glory. Date and identify the toy truck's maker and model by looking in a current value guide for vintage toys. Some rare toy trucks are valued in the hundreds or thousands of dollars. When in doubt about the value of a truck, have the piece appraised by an experienced vintage toy collector. Remove the front bumper, grille and headlights. Many old toy trucks have bumpers held in place by rivets underneath the front of the pickup. Grind the rolled part of each rivet using the high-speed rotary tool. A small flat-head screwdriver helps pop the rivets out of place. The grille and headlights should fall off once the bumper is removed. Remove the tailgate. The tailgate comes off easily with some gentle prying from the flat-head screwdriver. If the truck has chains, toss the old ones and make a note to pick up reproduction chains. Bend both ends of the tailgate outward with the needle-nose pliers. Continue bending, gently, until the tailgate comes off. Apply a couple drops of dish soap with the cotton swab at the point the whitewall meets the tire. Insert the screwdriver into this space and pull off the whitewall. Remove the tires from the axle. If the tires seem salvageable, scrub all four with the dish soap, warm water and toothbrush. Reproduction tires are available if the old ones can't be saved. Bend the two tabs holding the the cab wrap in front and the tab at the chassis with the needle-nose pliers. Once the tabs are bent, pull the cab forward and off the chassis. Leave the roof attached to the cab. Clean and polish your chrome and metal attachment pieces (like the bumper and tailgate). Begin by using the dish soap and warm water and, once dry, apply the polish with a clean rag. Clean the cab in the same manner. Clean the windshield with the soap and warm water. Inspect all the truck pieces and list any items requiring replacement. Order the necessary parts from a restoration toy parts shop. Strip the old paint and rust from all the truck parts, including the axles. Use sandblasting equipment for a better result. Wash the parts with the soap and warm water, and rinse. Allow the parts to dry completely. Prime all metal parts immediately after stripping and cleaning. Follow the primer instructions in order to prepare the parts for paint. Follow the paint instructions carefully and paint all metal parts in a well-ventilated area. Allow paint to dry completely. Apply a second coat, if necessary. Wind electrical tape around the tips of your needle-nose pliers. Align the cab with the bent tabs and bend the tabs back into place to secure the cab. Attach the tailgate in the same manner. Put the tires and wheel caps back together. Use the speed nuts to attach the tires to the axles. Pop the headlights back in place along with the grille and fit both to the front bumper. Place the aluminum rivets in the holes and cover with a dab of "chrome-colored paint." Attach the new chains, if necessary, and any replacement decals. Use a hair dryer to dry truck parts quickly after washing. Jennifer Marlowe is a seasoned journalist with experience since 1994. As a former reporter and columnist, she has written for a variety of publications including "The Cleveland Plain Dealer," "Sew Simple Magazine," "Northern Ohio Live," "Ohio Game & Fish" and "The Country's Best Log Homes." Marlowe holds a Bachelor of Arts in English literature from the University of Akron.